To have gone blind and regain vision is a miraculous recovery thanks to the efforts of one of the best eye hospitals in India.Reincarnation of healthy vision in my existing life because of corneal transplant is one I won’t forget. For decades my life felt meaningless and purposeless. I was handicapped for almost 30 years due to my eye problems. My left eye had white spots which worsened over a period of time and finally I was deemed blind by my left eye. For about 10 years, I have been consulting various eye doctors, eye specialist but all they did was tell me that I am growing old. Constantly during the consults I was asked as to why I felt the need to treat my left eye. All they did was give me eye drops and disappointment. My hopes shattered always. My existence seemed to fade. I had suicidal thought and this worried my kids who would constantly be around to make sure I was happy. This was saddening as I felt I was stealing their comfort, peace and happiness. I am blessed with cute and beautiful grandkids who I love more than my life. I have missed out their achievements due to my eye problems. I couldn’t see anything from my left eye and to add to the burden was the growing cataract in my right eye. I would end up tripping and falling anywhere I went which resulted in bad knees and fractures of my legs. I got tired laying in cast always whenever I decided to go out. Due to this reason I stopped stepping my foot out of the house. I couldn’t attend weddings of my near and dear ones as taking care of me would be a hassle in all the hurry burry of wedding house. My grandkids and children love the food I cook but due to my poor vision I stopped cutting vegetables as I would end up adding the dirt or worms in the dish. I am a walking encyclopedia of eye hospitals in Mumbai. I have gone to extreme lengths in search of an eye hospital that would help me out and treat me and not disregard me. I have visited every masjid, mandir and church seeking inner peace. After decade of struggle I finally gave up. I wanted nothing to do with my eyes and cornered myself. It so happened that my son-in-law who stays near to my place asked me to consult for the last time at one of the best eye hospital in Navi Mumbai on Palm Beach Road, Vashi called as Advanced Eye Hospital and Institute (AEHI). I grew furious because after years of seeing me struggle to walk even 2 steps he still thought I should consult another doctor. After a lot of persuasion I decided to come down to the eye hospital with my daughter and son-in-law. As I waited for my appointment, the staff was courteous and asked me if I needed anything. I was pissed off with my children because they forced this decision on me and I wanted them to see how it feels to be on the receiving end of bad news so that hence forth I am never asked to consult. With a grumpy broken heart, I stepped inside and talked to Dr.Vandana Jain, a Cornea and Cataract Specialist . At this stage I was emotionally and mentally bankrupt. My son-in-law then told me that Dr. Vandana Jain is one of the best eye surgeons in Navi Mumbai and whatever she would suggest would always be in your best interest. Dr. Vandana Jain asked me to sit in front of a machine with my chin on a stand and examined my eyes. Dr.Vandana Jain told me what is wrong with my left eye and took time to explain the whole situation and councel me. She also told me about cataract in my right eye. And here comes the news I thought- “There is nothing we can do about your left eye. Just live with it”. Dr. Vandana Jain, a Cornea and Cataract Specialist told me that I can see again with my left eye after a transplant and would treat the cataract in the right eye and I can have my clear vision. To this I said "I am too old; do you think it is necessary?" She swiftly responded “Age shouldn’t come in way of having the honor to see the world clearly. When medicine has evolved; why the need to suffer. My heart seemed like it was sewn back to life. Tears trickled down my cheeks as I heard all the encouraging words she had to say. I was then told about eye bank in Parel where I would have to fill out a form for my eye requirements. While I was anticipating for a donor, Dr. Vandana Jain suggested I should get rid of cataract as I would have some vision. It made sense though I was reluctant to begin with. I got my right eye cataract operation. 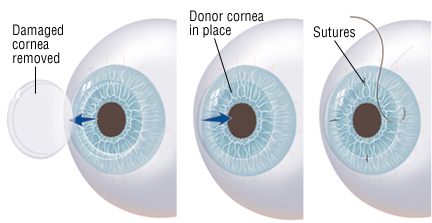 In few days after filling forms for eye donor, II got a call for potential eye donor which lit me up. I was called to AEHI eye hospital and the eye operation of corneal transplant was carried out. Dr. Vandana Jain did the eye operation and did tell me I would have few stitches but it would be there only for few days. Today I can see with my eyes all due to the hard work, determination and trust Dr. Vandana Jain inculcated in me. If it weren’t for her I wouldn’t be living a life now. I feel alive and happy for being able to share all the moments with my family that I missed. 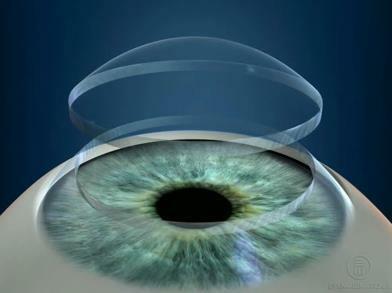 Dr Vandana Jain is a renowned Cornea, Lasik and Cataract surgeon and the Director of AEHI. Dr Jain has won best fellow awards and medals at Delhi University and L. V. Prasad Eye Institute and then further trained at Harvard, USA. Having performed more than 10,000 cataract operations, she has vast experience of dealing with all kinds of complicated cataract surgeries. According to her cataract surgery needs to be customised to the patient’s needs and physical disability. She additionally believes that team work and alliance with other specialists help in planning and giving the best cataract surgery results to the patients.